Here's proof that there was a time when absolutely everything was for sale in avocado green. I used to think that avocado was a color reserved for kitchen appliances and primary school counter tops (and avocados of course! 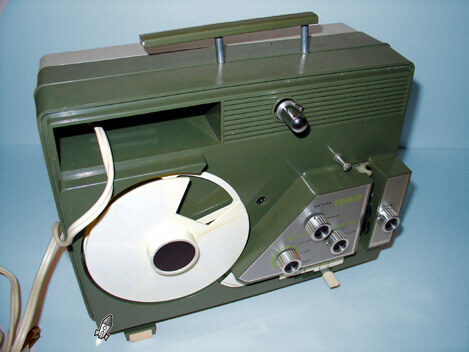 ), but here it is – a pea-soup & ivory colored Super 8 projector. It's easy to forget that home movies weren't just the turf of spendy camera shops. Regular department stores wanted in on the lucrative domestic cinema market. This Montgomery Ward 866 projector simply has to be from the 70's (I'd welcome any confirmation of that) from the color scheme. Of course the 70's were back when Super 8 was king. It's quite compact, maybe about the size of a six pack of tall-boys (I'm thirsty as I write this - so kill me...). The take up reel is neatly built in (though the hub is oddly for regular 8). Montgomery Ward looks like they wanted to simplify projecting home movies with this affordable projector. The threading is much simpler than most projectors, which makes me fear for the safety of any film I'd run through it. 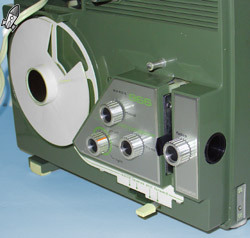 All of those extra gears and spindles that you see on larger projectors are there to take the strain off of the film as it runs through the projection path. Not the kind of thing I'd want to eliminate to reduce costs. I can't run it because the rubber belt inside has rotted to bits. Looking at the internals it's simplified compared to most projectors I've seen. It's got forward and reverse as well as a still function – not totally commonplace features, especially in what was probably a pretty affordable projector in its day. Since I have so many misgivings about the safety of this “monkey wards” projector (no wonder they went out of business in 2001!) I doubt that I'll ever run movies through it. It doesn't look like I'll be missing much. Check out the tiny lens. The lamp is plenty big but not much light seems to make it out the front of the thing. Sometimes department stores can sneak out something crazy and cool (see our post about the Sears Silvertone guitar), but in this case I think they should have saved their avocado green for a washing machine.